Got cold hands or toes when riding this time of year? If you don’t like how hot your ski gloves make your hands when cycling and would like more dexterity when shifting or using your smart phone….Defeet has ya covered! 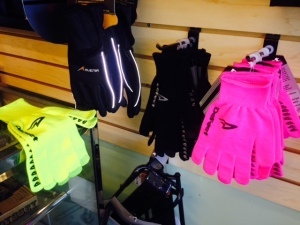 We use and recommend their new Duragloves($22) with integrated smart phone touch screen capability. The first two fingers and thumb will keep you connected. We also received some of their Woolie Boolie wool socks($19). Wool is a great material that breaths when you are generating a significant amount of body heat and they’ll keep ya warm even when wet. We have a couple different colors of the gloves and women’s sizes too. 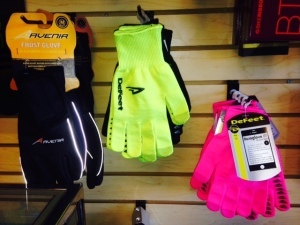 We have some Avenir Windproof Gloves are a great buy at $30. 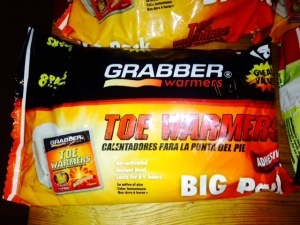 Toe warmers and hand warmers! 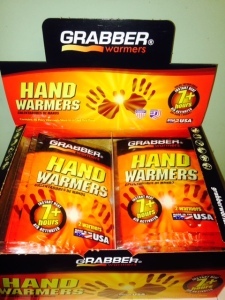 If you ask the pros and people that ride a lot in cold conditions they’ll most likely recommend warmers such as these for when the gloves and socks aren’t cutting it. These items all make great gift ideas!! This entry was posted on Thursday, November 20th, 2014 at 12:44 pm	and is filed under Featured Items, Uncategorized. You can follow any responses to this entry through the RSS 2.0 feed. Both comments and pings are currently closed. « New Inventory from Marin Bikes!